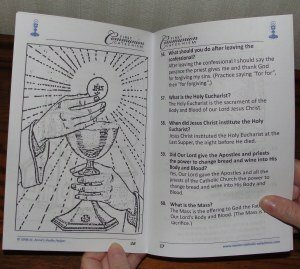 Our printable First Communion catechism ebooklet has the Baltimore Catechism No. 1 answers and prayers. Children love to color the pictures. Coloring pages interspersed according to topic. Print on 8.5x11 paper, fold and staple. Print again and again! Personalizable keepsake for each of your children. First Communion questions and answers. Roman Catholic prayers for children. Have you looked out over the class and wondered just how many of your students are going to have the time and help at home to learn their Ten Commandments and Catholic prayers? CCD? Religion class? Catholic home school? and the New Saint Joseph First Communion Catechism. Teach your students to love Jesus. Teach them to know, love, and serve Him. Teach them the right answers the first time. That way you and they can choose good books and activities for their whole lives. Pray for them. Pray with them. Best? Take them to Mass and teach them the parts of the Mass, that it is a prayer, and that they should pray it following the priest as best they can. Watch them grow in grace. Watch them learn and know right from wrong. Treasure your time with them as they learn what God wants in their lives. Teaching children about Communion is one of the most dear memories I have in all my parenting (and parish) efforts. There were many times when I was anxious that our children would learn enough, or that I would do a good job of conveying what the Church teaches about Communion and the other sacraments. Over time, I see that simply praying for them and helping them practice the prayers and the answers to the Baltimore Catechism in small amounts frequently was most of what I needed to be sure to do for "class" or for homework and study. Having this Communion book close at hand makes it easy to practice the answers on the spur of the moment. Having it as a file that can be printed over and over is great for the days you lose the first copy. When the first one wears out. Print another. Print one for each child. Let the children keep their own and color the pictures. Keep a copy in the van, another by the couch, and another in the school room. Once your child can pronounce the words (this usually takes one-on-one work) then all he needs is a boost with review to understand or eventually memorize the most important Catholic prayers, Ten Commandments and facts about the first Catholic sacraments. The best practice for the prayers is teaching and saying the Rosary every day. Add the Act of Contrition and you will cover most of the First Communion catechism prayers for children. After the Consecration It is Jesus, God Himself, Creator of Heaven and Earth. This is the minimum knowledge that any candidate for First Communion should know. It is also one of the questions that most parish priests will ask, but it's also the question that most catechisms do not answer plainly. Beyond this, the more that your child prays and learns about Jesus, the Sacraments, and the saints, the more likely he will be well disposed to receive Communion for the first time. A well disposed First Communion can be the beginning of a lifetime of sanctity. Do you wish you could print a Catholic Ten Commandments worksheet for them to practice writing? 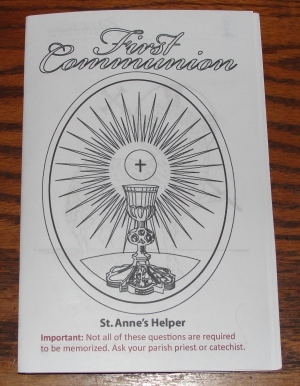 Buy our First Communion worksheets. Would you love to recommend a tutor to help them practice? 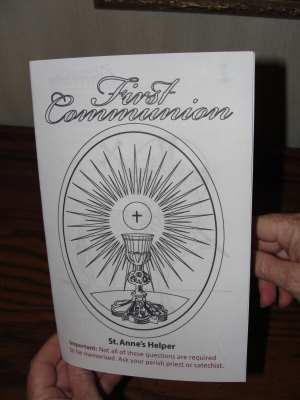 Buy our audio First Communion catechism.